Bored of your regular nut butter blend? Jake’s Boost, a health food startup, is bringing a delicious vegan nut and seed butter to people in need of a change, called TigerBoost. It’s filled with sunny tropical flavours and extra feel-good factor, as each jar donates free meals to UK children in need. Jake’s Boost TigerBoost is a special blend of cashews, brazils, sunflower seeds, tiger nuts and coconut to give you a protein-rich energy hit that doesn’t taste like a regular nut butter. It’s free from all nasties like sugar, salt, palm oil and additives, with a boost of additional nutrients from the array of ingredients. It has the richness of a biscuit spread with speckles of exotic coconut running through it. The natural but subtle sweetness comes from the tiger nut and coconut. 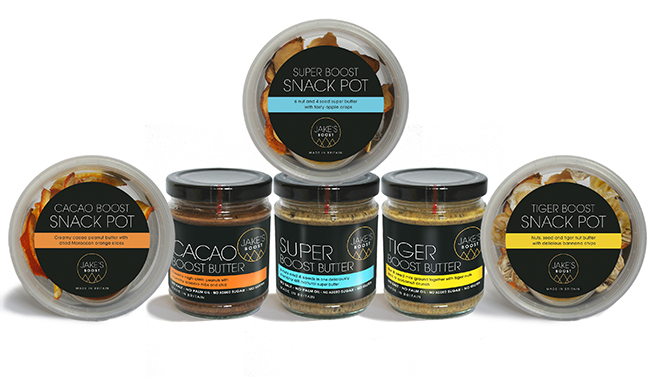 In addition to TigerBoost, there are two more flavours: Super Boost Butter, which has 10 different nuts and seeds, while Cacao Boost mixes Peanuts, Chia and Cacao nibs. The butters are available in snack pots for those on-the-go moments. A handful of air-dried banana chips, apple crisps and orange segments make perfect spoons with which to enjoy the blends. The natural sweetness of the fruit crisps create bursts of sweet-savoury crunch in the mouth. With only 180 calories in each pot, those sugary cereal bars can move over and make way for the healthier calories. Not only do they taste good, they’ll also they make you feel good inside and out, as 5 per cent of profits are dedicated to charities fighting childhood food poverty, including Make Lunch. Hot on the heels of Conservative party plans to scrap free school lunches, Jake’s Boost is fighting UK child hunger with nut butter. The company is celebrating the early success of its crowdfunding campaign by surpassing the initial target within the first 50 hours. The UK is the top 30 richest country in the world, yet 3.5 million children are living in poverty and 1.7 million live in severe poverty. The funds for the campaign will be used to grow the business and feed more children. The plan is to produce large test batches, develop more convenient and environmentally friendly packaging for the snack pots and invest in a marketing campaign. The mission is for Jake’s Boost to become a multi-social enterprise that offers socially conscious consumers a range of lifestyle products that support individual ethical causes. Jake’s Boost products are available to buy online at jakesboost.co.uk, at selected delis such as Eat17 and several online marketplaces including Yumbles, Nurtured foods, Big Barn and Tabl. For more information, please visit www.jakesboost.com.